Oprah has a name for this……. Not everyone has the opportunity to experience a full-circle moment in their lifetime – that epic twist of fate when something you had spent so much time dwelling on in your past creeps up on you in your present. I had one of those moments today. I am a product of the 80’s. I was never a slave to the hair and poorly-chosen fashion (most days) but the movies of the 80’s live on in my current reality. I can recite those movies verbatim and I recognize a bit of myself in each one of those iconic movie roles that I watched as an impressionable teenager. And though there were fleeting moments of seeing similarities between the starring roles and my teenage psyche, I always felt a deeper connection with the weirdos, the poets, the dreamers. It was this truth that bonded me to Andrew McCarthy’s character, Kevin, in St. Elmo’s Fire in 1985. Though his role was meant to be a bit of an outcast, Kevin was the definition of how I saw myself in those days. He was a creative soul, misunderstood on many occasions but he held true to himself. Unlike me at the time, Kevin knew who he was and, although he struggled, in the end he wasn’t afraid to be that person. He wanted to describe what he saw in a myriad number of ways. He wanted to describe life by every little detail and not just watch it go by. He wanted to write. And he was going to see his way to his future on his battered Underwood typewriter. That line stuck with me. It haunted me, actually, and I have seen that written line in a loop in my head for many years. Like a headlining banner at a movie theatre, the words “battered Underwood typewriter” scrolled incessantly around my brain. 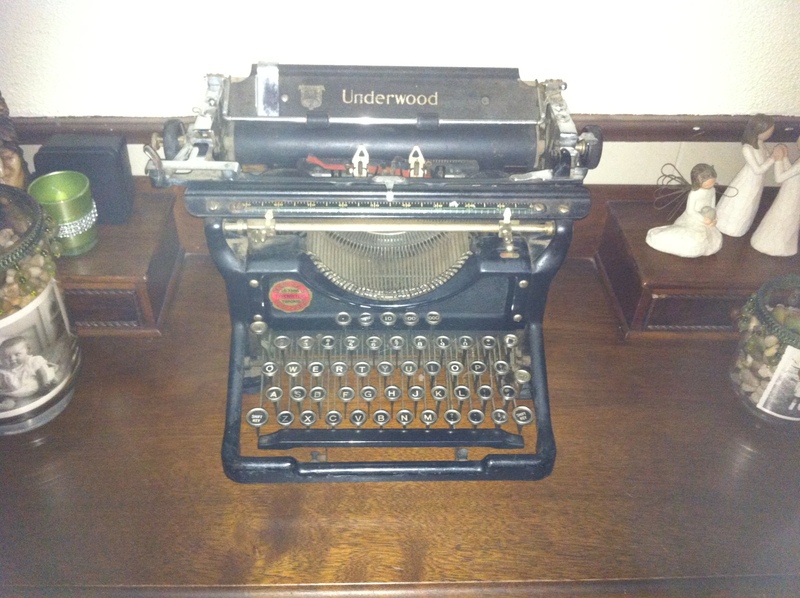 The image of that machine, the clacking of the keys, kept me bonded to that dream of writing. And now that image has become a reality. In a moment of complete serendipity, I have been gifted an Underwood typewriter. I have been given a battered, plunking, beautiful, historic typewriter that could write chapters of its own given the chance. Its stories are burned into the keys. Its ribbon holds a wealth of ideas and the rest is not history, but my story. It is up to me to cajole the remainder of the tales from this relic. This battered Underwood typewriter could be the one thing that reminds me that I can write and, just maybe, will help me get to the next stage of my writing success. Inspiration and motivation all in one battered package! May the keys rise up to meet you and may your ink never run dry! Ah yes….I should type that on a piece of paper and keep it in plain sight!! Oh, how I love manual typewriters. Mine’s an old Royal, but the Underwoods are a work of art. Also, I always identified with Anthony Michael Hall. Less 16 Candles more Breakfast Club. He was brilliant in the Breakfast Club. That letter was also one of the things that made me want to write. And don’t worry. I never brought a harpoon gun to school. Excellent! I write about John Hughes A LOT, and how much his movies influenced me as a teenager, and how I even use them as examples to my own children. I’m not sure I would use a manual typewriter for more than anything but a pretty thing to have and look at, but there are tons of other ‘props’ from those movies that would resonate deeply within. Enjoy! Thank you so much. Just the thought of it being in my house is very inspiring. And John Hughes was a genius!